Compare the stats & general application in this comprehensible weapon list for all Assault Rifles available in PUBG Mobile. *Each Column dictates the Magazine Capacity, Damage Output, Recoil, Maximum Range, and Rate of Fire out of maximum of 100 in that specific order. 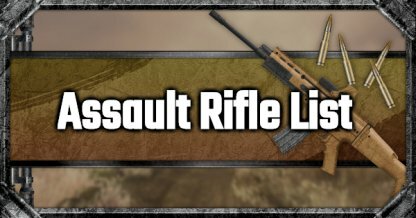 The Assault Rifle is an extremely versatile weapon type; able to perform well in any combat range but especially excelling in mid-range combat. This weapon is a preferred weapon for any loadout. Knowing when to switch the multiple firing mode is the key to maximizing your weapon's performance. Use semi-auto or burst fire for long range, and full-auto for close range. Fires 7.62mm rounds and has both a single shot and a full auto mode. Deals a lot of damage in single shot, but its heavy recoil makes it harder to control. Recommended for veterans only. Fires 5.56mm rounds and has both a single shot and a burst mode, which is very fast and deals very high damage in close range. But it does not have a full auto mode, and the burst mode is difficult to master. Fires 5.56mm rounds and has both a single shot and a full auto mode. Light recoil, stability and accuracy make this weapon easier to master. Fires 5.56mm rounds and has both a single shot and a full auto mode. Can be equipped with lots of attachments to become an all rounder at any distance. Obtained from air drops. Fires 7.62mm rounds and has both a single shot and a full auto mode. Deals a lot of damage to single shot with high rate of fire. Obtained from air drops. Fires 5.56mm rounds and has both a single shot and a full auto mode. With light recoil and great performance in mid-to-far range, it doesn't have any very visible weaknesses.